I'm a sixteen year old girl and i played badminton competitively. I played almost 7 days a week sometimes twice a day. Training 5 times a week on court + interclubs and tournaments and even went to the gym. Mid June this year during a singles match for interclub, i took a shot at the back where i put all my weight on my left leg and bent it but must have slightly twisted it. My knee gave way with a pop and i was on the ground. Apparently it looked like i was laughing but i'm pretty sure i was in pain... I was carried off court and had my knee iced. Luckily we had a physio still at the hall so i got crutches from her and she told me to just go home and rest. I saw her the next day and she said it was possibly a MCL strain and ACL rupture. After an MRI scan and seeing a specialist then a surgeon ACL rupture was confirmed + possible meniscus tear. It required surgery and i would be out the rest of the season and maybe the next one too. I took it bad for the first month, it felt like all that time and effort was for nothing. But eventually i got over it. I saw the physio regularly for the first month was doing exercises but got a bit lazy as it got closer to the op due to exams. My surgery was scheduled (30/09/11) about 4 months after, due to all the waiting (swelling to go down, full ROM, appointment, mock exams etc). reading heaps of stories about the pain that would follow). I had to be injected 3 times because they couldn't find my veins >< but as i was given the anesthetic, one moment i was awake and the next i wasn't. I woke up in the recovery room but still half asleep while i was given pain killers and had my blood pressure taken. I was taken to the wards about half an hour later. The nurses were lovely and regularly came in. I was really tired struggling to keep my eyes open while i ate dinner and watched rugby. My entire left leg was still numb and i had a cyro/cuff cooler over my knee the whole time and so far no pain. The next morning i was still feeling pretty good. 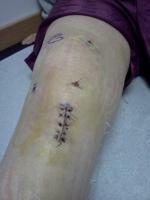 The surgeon came and said the surgery went well, he stitched my meniscus and constructed me a new ligament (hamstring). I was discharged but had to stay in the car as my mum was running errand and my knee started to feel a bit uncomfortable due to having it bent and without ice for a couple of hours but it wasn't too bad. I'm now resting at home and taking a week off school. 3 days postop i was completely off painkillers.